Aaron: (putting the date on the digital recorder, he has asked what the year is) When you're as old as I am, the year is as a snap of the fingers! It's all one flowing time. You create these artificial distinctions. I recognize there is day and night that gives you this 24-hr period, and yet the time is constantly changing through the time zones around the world. Even the phases of the moon are artificial distinctions. If you travel far enough out from Earth, the moon looks different. No days, no phases of the moon; no hours or minutes; just now. I asked Barbara to include in the handout what you commonly know as the Lord's Prayer in Aramaic. You have heard me speak of the lifetime in which I was incarnate at the time of Jeshua, and heard him offer such prayers, when people asked him, "How should we pray?" He said, "Do not pray to anything outside you but pray to that sacredness which is within everything." This Father, Mother, Cosmic Birther, it's not separate from you. (Reading from the translation) Our Father, Which art in Heaven–that is this core of divine sacredness which we each can find, each expression of that divine can find within the sacred space within the heart. Hallowed be Thy Name–the sacredness. Hallowed–blessed. Be Thy–the word Name to me refers to the sacred sound OM. Blessed be that sacred sound which dwells in the innermost heart of everything. I'll go on to talk about this step by step as we read through it today, at different intervals. But please do not think of this sacredness as anything separate from you. And when you say Thy will be done, you're not saying, "I'll do whatever you want," you're saying, "I obey this sacred sound within me, this sacred wisdom and clarity and love. I will listen for that and no matter how quiet it is and no matter how loud the ego's voice is, I will keep coming back to that sacred sound within the heart. That is the will I will follow and not the voice of ego." I want to invite your questions of any kind to me and to Heather in this 45 minutes before she must leave, and then we'll come back to our program. Heather, I want to thank you so much for sharing of yourself with the group. Heather: Thank you so much for inviting me. I have learned so much from Aaron and Barbara. It was a great pleasure to be here with you all. Thank you so much for inviting me. Aaron: Thank you. So we open the floor to you. Q: I thought we were going to do an exercise on soul retrieval? I think a lot of the journeys we did over the last 2 days, day and a half, quite a lot of them are advanced journeys. So I've taken bits from different practices of shamanism and brought them in for you because I knew that you could advance very fast. Even a beginning journey is usually a 3-day workshop and so we've done some of that. Some of the advanced practiced, of transfiguration, but it's a lot of work so just allow yourself to integrate this, to process some of this stuff, and of course, practice. The most empowering part of journeying is the guide connection. So if you went to your guide and he came back with this, it's like, "Oh, I need clarity," so you go back to your guide and you continue that dialogue, you and the guide, and that creates a very strong alliance. The potency of the shaman is really the shaman, or like Barbara is a shaman, of her alliance with her helping spirit, her guide, that there's absolute faith and trust and she can go in and ask a question and get the answer very quickly. So I think that's what Barbara and Aaron do, and I hope that you will develop by practicing journeying, and so that you can go in and get an answer. If you have a dream, go to your guide, "I'd like to understand this dream better," and your guide will help you. You can go back into a dream and finish the dream. Q: Would you come back next August? Heather: I would love to. I would love to. Just invite me and I'll be here. Thank you very much. Q: I thought we were going to journey into a rock. Heather: Well you did the crystal journey with Barbara. Q: And so if we did want to try a rock, we'd do it the same way? Heather: Yes. Remember how you did the rattle? Hold the rattle in your hand and go and ask that to show you its essence. And then communicate, "Thank you for working with me as my instrument to take me on journeys and working with me for the highest good, always in service to the light." Remember you did that and you saw the essence? I did it at the end of a journey. So even my drumstick, I journey to the essence of the drumstick to ask it to work with me, and my drum. I don't have a lot of accoutrements. I like to keep things simple. This is my altar, very simple. But the journey, the visualization with Aaron, replaced the rock journey. We just began to run out of time a little and, you know, we've had such a blessing to have Aaron come through, and to have the Brother and Sister of Light come through, to give you an idea of the guides and the differences. So I think that was an enormous gift and confirmation for this class. Q: Can a rock tell you its history or the history of the place it's in? Aaron: If our weather permits, we will go outside later today or tomorrow morning and hug trees and join with the energy of the trees. I'm also going to lead you on a different kind of journey than Heather did to meeting your higher self or guide. I teach it a bit differently. Heather, I take people into a, I would not say a dangerous but an uncomfortable situation, and allow them to experience a place where they feel they need help. They learn to reach for that help and to find it there, to travel on with the help walking along with them, supporting them along this slightly arduous journey. Then they come to an open space where they can sit with this helper, this guide, just sit and share energy and get to know each other. We don't do this with drumming or rattles, just as a guided meditation. Heather: Yes, perfect. In core shamanism, all of this is done without guided meditation but it takes a long time. You have to go to a tree, go down the tree, or up it, and so it takes a long time. So I have developed this guiding you to a sacred space to work well and the guides love it, they're absolutely waiting there. It makes for what would normally be a 3 day workshop, but we can bring it into one day, half a day. So the ultimate is for everybody to connect to their guides, their power animal guides, quickly, swiftly, lovingly and with comfort and ease. And so once you've connected then our work is to develop that friendship and deepen that friendship, and the deeper you get, then you needn't use your drums. You can use them in the meditation but the intent was to connect you to your guides and deepen that relationship, to be working on your own and to be working with Aaron. The weather kept us all inward like bears, gathering our wisdom. But had the weather been good, Aaron and I were going to do a kind of joint journey together for you all on the edge of the lake where you'd have half a leg in the water, half a leg out, so you could merge with the water and the earth and the sun and the trees, and it would have been... but perhaps that's not what we were meant to do since we didn't get the weather for it. But I'm sure you'll have wonderful opportunities to practice this with Aaron. So there'd going to be drumming outside and you'd be working more in nature. Q: You can just stand outside and you'll be connected to water (it is raining hard). 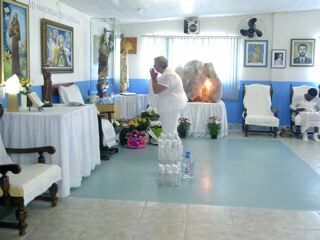 Aaron: In Brazil there is a wonderful waterfall at the Casa with very powerful energy, very high crystal-type energy. It felt wonderful merging both with earth and water, really with all of the elements. There's fire in it, there's air in it. But one is especially aware of the earth quality, the crystalline energy, and of course the water. When one stands under it, the whole sense of self dissolves, there is just a flow of elements. One becomes the elements, one knows the elements from within. Some of you have been with me on Emerald Isle and done the meditation where I had you lying on the sand at the water's edge with gentle waves just coming up and sometimes lapping at your feet. We have a wonderful video of N, I think, sitting on sand but allowing herself to be moved as the waves came in, one of them coming in waist high and just washing her over, floating on the beach, moving lightly with the water and feeling the sand settling under her and the hot sun beating down, the breeze blowing. This is what I had hoped to do with you this weekend but it's fine that we didn't do it. As Heather said, we've been guided more to go within, in a different way. But perhaps next August we'll do it. We definitely will not try it in November! Q: Have you ever recorded your journey, or have you ever written–you do such a beautiful job, Heather, of setting the intention and calling the spirits and setting the space. Have you written about that? Heather: No, it just comes up from inside, but a friend about a year ago, last June, I was invited to teach for a minister in New Jersey. The workshop was held in the Masonic Lodge. I thought, "Whoa, I thought only men were allowed in here." But it was fascinating because the walls were half blue, just like at the Casa. And of course King Solomon was the first entity that came through for John of God. For many years he was primary guide. So the minister took me up and showed me. They have triangles and the eye and the compasses. So I showed a video of John of God there and then we did the spirit canoe. And I did about 4 healings. A friend of mine videotaped it. And it was amazing to see the video because everybody was so centered. You could see them all, like they were really navigating the rivers. It was fascinating. But I haven't recorded anything, no. It was amazing to see that because you know, some people were on chairs, some were on the floor. Originally the feedback was, "what are we doing?" Then they really got into it. We did about 4, I guess, and it was fun to see that. The minister in the front said he was being sprayed with water. Q: When we do our journeys at home, is it okay for our animals like our cats to be in the room with us? Heather: They love it. I used to, somebody was doing some work on my house and she had a little poodle. I would go into my little healing room with a client and close the door. And as soon as I started either Reiki or drumming, she would come and scratch at the door and then she would jump in, sit on my lap, and when the energy finished and I closed off the beams, she'd jump down and go back out. They love it. You can direct the healing energy to your animals. So if you transfigure into your divinity and sit up, then just send the energy to your animals. They'll come around you, they'll feel it; they'll tell you when they've had enough. See them as healthy, divine, and holy. Everybody you're working on, you always see them whole... never the pity because that creates more pity energy for them. Always see them as healthy and well. Aaron: Some of you will remember when Deep Spring classes were held in Barbara's living room. Barbara's cat had her own zafu. At the start of the meditation she would come and sit there in the middle of the room. As soon as the closing bell rang, the cat would get up and walk out. Q: How do we live with our crystals day to day? Aaron: I'll talk more about that with you... Barbara will bring her whole tray of crystals down, I don't know if she plans to do that this week or not until November. Live with them day by day as you would with a dear friend. You don't ignore a dear friend. If you have beautiful flowers, you add fresh water and you thank the flowers when you come into the room. You notice them. You open your heart to them. You look at the beauty of these flowers, with gratitude and appreciation. You might take a certain flower and just hold it for a moment, feeling its energy. With the crystals because of their deepened intelligence, you also can hold them while you meditate, just holding it in your lap, holding it in your hands. This crystal is a bit big to hold in that way, but hold yours in your hands as you meditate. Then ask for its help. For example, if the mind is very restless, note "restless, restless," noting how the restlessness feels in the body, the direct experience of the restlessness in the mind and body. You are not trying to fix it, just aware of it. That which is aware of restlessness is not restless. Be present with that restlessness. But then at a certain point you can ask the crystal, "Is there something I need to know about this restlessness?" Ask that crystal energy. The crystal is not separate, just as in the Lord's Prayer the divine is not separate. You're asking the question of the innermost crystal of your heart. You're using this material crystal as a way to connect to the inner crystal. So you're asking your own highest wisdom, "What is this restlessness about?" And then letting go, not searching for an answer, just present and allowing clarity to come. And if it doesn't come then there's just restlessness. Or anxiety, tension, anger, fear, sadness. So you can ask your crystal in this way. It connects you to the crystal of inner heart. When you ask in this way, the answer is a mix of your own deepest wisdom and the wisdom of this material crystal, which has its own intelligence. Take care of the crystal simply by your friendship. Let me put it in this way. I would not say, don't let others handle your crystal, but if they handle it then cleanse it with clear water. Bring it into the sunshine. Invite it to release any negative or distorted energy it's picked up. It will cleanse itself when invited. Don't stuff it into a dark corner. You can literally bury the crystal in the earth for a short time. I don't mean for months, I mean for an hour or overnight. Invite it to gather earth energy into itself and release what it wishes to release into the earth. Then bring it out in the morning, wash it off and bring it into the sunshine again. Ask it what it needs. Do you have anything to add to that, Heather? Heather: No, perfect. I agree with the cleansing process. Even add a little kosher salt in the water. Just let it be. I sleep with mine. It becomes your helping spirit, your best buddy. Think of it in that way. I have ones that John of God gave me and I carry them all the time. Once I forgot, my set. For 10 years I've had them and I told the entity I'd forgotten them, could I connect to them? And he said, "Would you forget to eat?" And I said no. He went and got me another set and gave them to me. And I carry them with me always. And they are like my best friends in a sense. Yes, put them in the sun, put them in the moon. They'll tell you what they want because they need to be in nature, too. Aaron: Shortly into her time of visits to the Casa, one of the entities came to Barbara in meditation after her return to Michigan and he said that he wanted her to begin working with crystals. She emailed Heather who was in Brazil and asked if Heather could buy some crystals for her and bring them back, as she'd bought just one small one, smaller than the ones I gave you last night. Heather was traveling on to another country, and said she could not travel all that way with crystals but she suggested somebody who had been part of that first group that Barbara was with, with Heather. She said he has some that he's brought back. He should be able to sell you some. Barbara emailed this man. He immediately emailed back and said of that Entity, that specific Entity who had told Barbara to get crystals, "He came to me this morning and said that he wanted crystals for you; he chose this one and this one and this one. He is preparing them for you and I will send them out." The man didn't want any payment, just said, "This is a gift that the Entity wants you to have." Barbara always travels with those crystals. They are not the biggest ones she has but they are very special to her. Q: Do all the entities work with crystals? Do you know? Aaron: When you say all the entities, all the Casa entities, do you mean? Aaron: They do not work with crystals there in terms of literal crystals, but there's a large crystal in the entities' current room. There's crystalline energy under the ground. The crystal energy supports their work. So it's not that they're holding the crystal and using it to magnify their energy; they have no need of that. Barbara standing in front of Joao's chair, in the Entities current Room. The large crystal referred to above is behind her. Heather: That's true. Sometimes the entities have suggested, ­– we're working a lot in the Casa, I volunteer a lot there, – and they suggest the male/female crystals which come from very deep in the ground. The entities have us work with those. But they themselves (don't hold crystals). John of God has his own crystals, he doesn't need to carry them with him anymore, of course. He loves crystals, he loves the energy from crystals, the potential for crystals. And the Entities very much honor the work with crystals. They don't say salt (for cleansing); they say Casa water, or sun, sunlight, or the moonlight. But it is true as Aaron said, best to keep these that Aaron has given you as your own personal crystals. You don't want people touching them. You can just say gently, well these crystals are something I work with and I prefer not to (have them handled). And not even have it in a display place when you're working, keep it in the bag and then have it beside your bed or in your office where you're working on your own. So it's your energy that it's working with, to keep it special, to keep it as your sacred (support)... Every shaman has in their medicine bag one stone or crystal that they keep covered from other people, it's their sort of sacred one, and I think since Aaron chose these for you, and they are very, very sacred crystals, I would keep it as such. Barbara is one of the only people that I know that isn't Brazilian that pronounces Medium Joao's? name absolutely correctly. It's not an easy name to say. Aaron: I have taught her. (laughter) This crystal Barbara has displayed here and makes available to people is what she considers her public crystal. It is a crystal with powerful energy. When she works at home, it's often on the table. Her own private collection of crystals that she works with in her daily work, she does not let other people handle; they are for her. But occasionally, if there is a special need, she'll offer one to somebody to use for awhile and when she gets it back, she cleanses it. She will always ask permission of the crystal first. Q: Two questions about crystals. My crystal has the glue from the sticker on it. Would I leave it as is or clean it with soap and water. (Yes.) And then what about the electromagnetic field from computers and things like that, is that detrimental to the crystals? Heather: I think that because there's such a vast electromagnetic field everywhere now, airports, everywhere, that I kind of feel that my higher self, if you will, or the divine, creates a force field that protects us from anything like that, because eventually I feel, and we'll ask Aaron this, that as humans we're evolving, and so a lot of the foods that have made people unwell in the last 10 years or so, that if we can take in everything as light and without fear–I had lots of allergies when I left Brazil. Then when I got back on my spiritual path, I saw everything as light so I didn't have those big reactions anymore. I ate sensibly but if I ate wheat or butter, I would be bright red within seconds. But now I eat it, I take everything in as sacred and my body will transmute that which I don't need anymore or is not good for it. But I eat a sensible diet. And by the same way I don't want to live in fear of these (computers) because these help us a lot. So I think the crystals can help bounce that (what is negative) away from us. We are evolving as beings so this (energy) just passes, doesn't have any effect. Just sort of like the headlights of a car. Q: Are there certain words you say for when you're taking in food? Heather: I give thanks to all who brought me this food and to the food itself for coming to be nutritious for me. And I take in all the food as nutritious and pure light. And I ask my body to release anything with gratitude that doesn't serve me in my highest purpose. So just think of it as, it just goes out, it doesn't have to linger in me. Q: My son is going to want this crystal. And I was thinking I'd let him use it on me. I think he wants to use it on my mother. But from what you're saying here, I should not let him do that. Heather: I think you can ask Aaron that, since it was a gift from Aaron. And Aaron's your primary teacher so I would ask Aaron that. Or you could always get him another crystal and let him work with that. Q: That's another question: how do I choose a crystal for him? Aaron: I would suggest you not share it with E and in January we'll find a crystal for E. He would need a different energetic crystal, very different than (this), something that will center him more. Q: Do you wear your crystal or carry it? I mean I have on my shirt in this little string pouch. Do you wear yours or carry it in your pocket? Heather: I do, I carry it in my pocket. My working crystals, they're a pair, male/female, they're slightly bigger, so when I'm at the Casa I have them in my pocketbook always. In the beginning the entities say, "Where are your crystals?" and I'd lift my shirt up. But I used to have these bulges in my pocket so now I wear them in a pocketbook. But I always take a little stone or a little crystal that I'm drawn to and have it in my pocket. I like seeds or stones and I love holding stones. This is a stone that came to me that has a little triangle in the middle. But when I'm walking on the beach, sometimes I'll look with the intention for heart crystals, stones, but not every one do I pick up. Sometimes I pick it up and I hear it say No. I ask permission. So little stones like that, this for me carries immense power. And when I'm thinking, I'll hold it. On my altar I'll always have a shell, so you're representing the elements. Little tiny crystal in here. Small is very powerful, I feel. You can just put a little shaving of a crystal or a seed in your pocket, on your altars, I was just going to mention that yesterday, to represent the elements, on your altars. So a feather for air. You can always put a fresh flower on, you know, for the earth. Little bowl of water I often put out if I'm doing a lot of work, and then I return that to the earth at night, asking for that to take any dense energy and become healing for the planet, for that to transmute it. A stone or crystal. And a shell, a simple shell. From a South American point of view we always have a shell. Aaron (off mic, Heather has mic): Would you go into Barbara's room and bring 2 crystals out? There is one very small irregularly-shaped crystal. Would you bring that and also the longest wand? Thank you. Heather: Here (pointing to her altar) I have 2 fir cones that I used instead of a drum when I first started journeying with Sandra Ingermann. So I've had these for about 14 years. And then little stones. I always have a little stone in my pocket. And jeans have the perfect pocket, this little pocket here. I think it used to be for lighters. A watch pocket. My father used this (showing an object) on his scarf when he was riding. Heather: That is from the Salish community, it's a way of community healing. All communities have a specific way of healing and that's a beautiful one which I just happen to love very much, where everybody can participate. To try and bring this sense of community, you all have a wonderful community here in Deep Spring and Barbara's. So a community healing of course is more powerful. It was very easy for me to get to that space of non-ordinary reality. I was right there. Whereas if I were journeying on my own it might have taken me 10 minutes or so, 15, but so you're going down the river and the whole community is holding that intention of the healing for you. So I think it's just a lovely opportunity for people to experience the non-ordinary and the ordinary. And the rowing, you know some people break sweats with that, they can feel the resistance of the water, they can feel the canoe turning around and coming back home. It's just a nice community and it carries with it of course a lot of history. We were calling in the ancestors, I'm sure we had some Salish ancestors here joining us for that ritual. P has brought in the two crystals Aaron requested. Aaron: This very small crystal which did not come from the Casa is what is called a Lemurian seed crystal. Have you seen these before? I will pass it around... Barbara will cleanse it afterward. These Lemurian seed crystals can be very large; they can be small. This none is small, but powerful. (Hands it to Heather.) Please tell me about its energy as you experience it. Heather: Well at the beginning, I connected to see the essence of this beautiful crystal and I saw the light coming in and a lot of indigo blue energy around it. And now it's just expanding and expanding. And the energy of it is filling this room. And it is yellow and white, and it has the colors of all the spectrum. And from indigo blue it's now absolute white light. And it fills this room, and is just very effervescent crystalline energy. Very light and touching my heart, feels like a lot of very, very vibrant energy, very effervescent. Like the bubbles in champagne only finer. Thank you so much. Aaron: At the ending of Lemuria, the crystalline structure of Lemuria became buried very far under the earth. Some of these crystals actually ended up in deep mines in Brazil and other places. So as these crystals now allow themselves to be found, they carry a more direct seed of Lemuria. Of course all crystals have some connection to Lemuria, but these carry a very strong Lemurian energy. They're very much a reminder of who you are, and who you were then. Pass it around and let each person hold it and feel its energy for yourself. This wand has bits of that Lemurian seed crystal but it's not fully a Lemurian seed crystal. It's a very powerful energy, different than many crystals. This one came from the Casa. It would have been more powerful if it was left rough at the bottom but it was polished all the way around. The polishing diminished its power. So it has traces of that Lemurian seed energy but not as strong as the small one. You'll see that while this is a beautiful and radiant crystal, it's a very different energy than that wand. What do you feel in that one, Heather? Heather: I'm getting an image of Jesus... It's a very calming energy, very different from the other crystal. This is very centering but the potential of it is vast. It is a much more masculine energy. Very willing to be of service. Aaron: Can you feel the touch of that Lemurian seed crystal but that little one had much more of that power. Heather: The small one had much more effervescence, much more light, very fast, seemed to be. This one is more steady, a little denser. Aaron: Feel how it contrasts with this (Barbara's public crystal), which is a beautiful crystal filled with rainbow light. Heather: This is showing me it comes from a mountain of a crystal, very deep in the earth. It's very grounding, it's very healing for the heart. It radiates love energy. It's like I'm seeing its mother/father crystal is this enormous mountain crystal right in the core of the Earth. But it is happy to be of service, it's happy to be with Barbara. 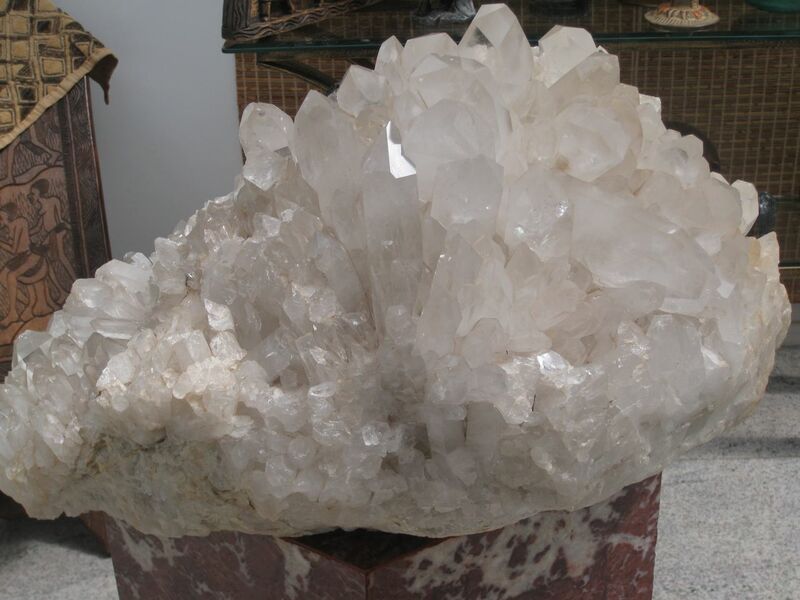 Aaron: Most of the crystals which I gave to each of you last night are similar to this from the Casa, very happy to be of service, filled with love. Crystals, like all beings, are evolving, and your crystal will grow with you. So it's not a stagnant object but it will develop. It will develop with you. This crystal cluster is in a friend's home near the Casa. It shows crystal in a more natural form. Aaron: Before you pack up your altar, Heather, let us just do a brief prayer and gathering together. Q: Can oneget any crystals that have not been touched by human hands? Heather: (amid background chatter)... everything has been touched because they're cut and brought to the Casa. I have been into the field where they're natural. They're very powerful, these, and they're all blessed by the entities. I am very sad to leave. It has been wonderful. Aaron(mic off): We offer our gratitude to this wonderful mix of human and spirit. great Masters, benevolent beings, earth, water, air and fire spirit, all the small beings, the faeries and others. We ask for their continued support in our intention to be servants in this world. We ask their help to observe the arisings of the ego and transcend them so that we may live our lives from the highest place of love with the highest intention of good for all beings, and the deepest knowledge of our oneness with all that is. I thank this daughter of light, Heather, for joining us. Whatever good has come from this gathering, we offer it out freely to all beings, that all beings may be happy and find peace. Heather, I offer you the microphone if there's something you wish to add. Heather: I'd like to thank you all. I'm sad to leave. I carry you in my hearts wherever I go. And I know that you'll have powerful, wonderful work with Aaron and Barbara, and all together shining your lights out brilliantly into the universe. And everybody that comes in contact with you will feel and see and sense that connection of oneness that you carry, and they will feel comforted, and their pain and suffering will be lessened. Thank you so much for inviting me. Thank you so much for your generosity on all levels. God bless you all. Group: (shungo!) We love you, Heather!